Which toy haulers are known/considered full time RV's so as to not have any warranty issues. I see a lot of people confusing luxury items like island kitchens with high quality. They are not the same. Slide-outs are not a good idea for full time - insulation and water leakage can become a big issue when you "slide out" the slide out fifty or a hundred times a year. Heated basement is a must to keep tanks from freezing. Look for the best quality ceiling vents. You don't want seams in the roof that will eventually leak, look for one piece roof construction. Also look for high-quality insulation. Avoid plywood construction as much as possible. Condensation swells plywood. The advantage of a toy hauler - no hauling toys in your truck bed or on a trailer. Fifth wheels are supposed to provide more stable towing. RESEARCH BEFORE DECIDING!! I am are only aware of two manufacturers that advertise their Fifth-wheels, and toy haulers for full-time use. That is Carriage and Teton. Although I am not sure that either company is still building new toy haulers. Many people use a Titanium toy hauler, but you'd have to check with the manufacturer to see if the warranty will cover your full time use. Some dealers will tell you any RV can be used for full time use, but always check with the manufacturer and any extended warranty you purchase to be certain you're covered - and I'd get that in writing too. 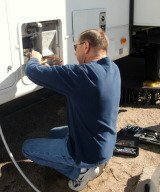 Less expensive RVs are not equipped to handle constant use, or insulated for four seasons. Considering the cost though many folks opt to use a less expensive RV and maintain, repair, or customize it as necessary. Full time in a fifth wheel toy hauler? Does anyone full time in a fifth wheel toy hauler? Is there anything better or worse about this option? We like to go out where we can ride our side by side 4X4 and also just tour around enjoying all kinds of countryside. Comments for Full time in a fifth wheel toy hauler? What brand of toy hauler do you have? We considered a toy hauler just for the convenience of being able to just pull the bikes, canoe, chairs, etc. right out of the back, but didn't really see any that we felt like had enough quality to work full time. We have a Harley, so we knew we'd want a toyhauler. The ones out there on the market today are more like a luxury hotel! I have an island in my kitchen, Corian coutertops, and our garage is separate from the living area. I even have a W/D combo! I would suggest you find one that has the separate garage, otherwise you're 'living' with your toys. And when you're at a site, you can take the toys outside and have the garage as the "Man Cave." It's working well for us! Good Luck! And buy the most quality for the money you can afford.